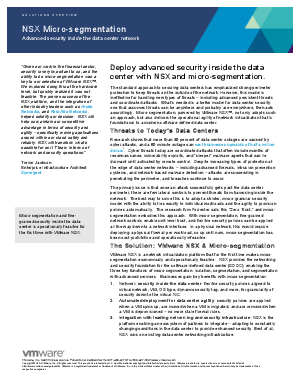 Most data center security emphasizes strong perimeter defense to keep threats on the outside. But this model is ineffective against today’s new types of threats, which may be borne by east-west traffic inside your data center. Some of these intrusions may lurk for days, weeks, or months to discover and exploit vulnerabilities. An existing concept called micro-segmentation is the solution. But until now, it was hardware-intensive and costly. In this solution overview, you’ll learn why micro-segmentation is now within your organization’s reach.